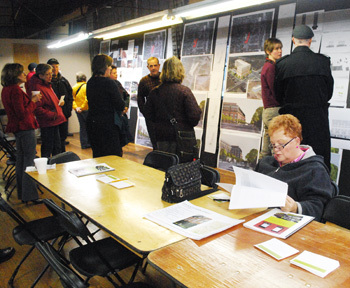 Residents gathered in the sewing room of the former Fox Tent & Awning building on Friday night for the first public meeting about 618 S. Main – a proposed apartment building that fronts Main, Mosley and Ashley streets. That part of town is perhaps best known for the local landmark Washtenaw Dairy, located less than a block away from the proposed development. At Friday’s meeting, donuts from the shop were offered as refreshment, next to a wall of drawings and maps of the project. 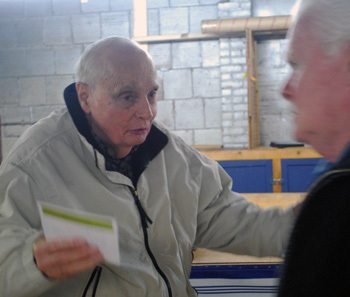 Washtenaw Dairy owner Doug Raab was among the 50 or so residents who attended. The building – a six-story structure, with additional apartments on a penthouse level – will consist of about 180 studio, one-bedroom and two-bedroom apartments, with rents likely in the $950 to $1,400 range. Two levels of underground parking are planned, with about 140 spaces. The project targets young professionals in their mid-20s to mid-30s, developer Dan Ketelaar told the group on Friday – people who are interested in an urban lifestyle, within walking distance of the downtown and University of Michigan campus. Ketelaar hopes the project will transform that section of Main Street and perhaps encourage the Ann Arbor Downtown Development Authority to make improvements in that area, as it’s doing now along Fifth and Division. Because the project as designed is about 80 feet at its highest point – 20 feet taller than what zoning would allow – it will be submitted to the city as a “planned project.” Planned projects allow for some flexibility in height or setbacks, in exchange for public benefits. They don’t allow as much flexibility, however, as a planned unit development (PUD). Ketelaar cited a large courtyard along Ashley as a benefit to the neighborhood. Another benefit he cited was the provision on site of double the amount of required parking. Parking was among several concerns mentioned by residents during a Q&A on Friday with Ketelaar and his project team, which includes a landscape architect who also helped design the new plaza and rain garden in front of city hall. Several residents said parking and traffic are already an issue in that neighborhood. City councilmember Mike Anglin – who represents Ward 5, where the project is located – urged Ketelaar to work toward narrowing Main Street south of Packard from four to two lanes, to slow speeds along that stretch. Ketelaar had mentioned the idea of improving that part of Main Street earlier in the meeting. He said he could suggest narrowing the road, but noted that it’s up to the city to make that decision. Other issues discussed at the meeting include the need to integrate the development with the neighborhood, the project’s financing, and details of the building’s design. Environmental issues covered at the meeting included: the site’s brownfield status; stormwater management; and relation to the floodplain. This is the second project to go through the city’s new design review process. 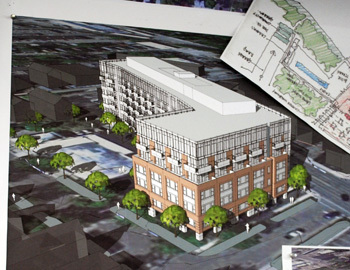 The first project to be reviewed in this way – The Varsity Ann Arbor – had been approved by city council the previous night. The design review board will meet at 3 p.m. on Wednesday, Nov. 16 at the former Fox Tent & Awning building at 618 S. Main. That meeting, which is open to the public, will be followed by another community forum on Tuesday, Nov. 22 from 5-7 p.m. at the same location. Ketelaar has previously met with local business owners and members of the Old West Side Association board to discuss the project. The project is expected to be formally submitted to the city later this month. After review by the city planning staff, it will be considered by the planning commission, which will make a recommendation to the city council. Construction could begin in the fall of 2012. Dan Ketelaar began by noting that the site sits on about an acre of land – roughly 44,000 square feet – bounded by Main Street and Ashley to the east and west, respectively, and by Mosley to the south. The property’s northern edge falls midblock, south of the Happy’s Pizza lot on Main and Affordable Vet Services on Ashley. Single-family houses line Ashley Street across from the site; all other sides face commercial property – South Main Market is across the street on Main. 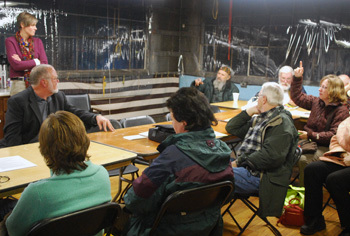 The neighborhood meeting was held in the building of the former Fox Tent & Awning, which closed in late 2010. Other buildings on the site house Ivory Photo, Deluxe Drapery and Overture Audio. These commercial buildings – which were constructed in the 1930s – would be demolished to make way for the project. Dan Ketelaar, president of Urban Group Development Co., the developer of the 618 S. Main project. Ketelaar said his team began working on the project in March, looking for examples of the style they wanted to reflect. He pointed to photos posted on the wall of the room – images of Bach Elementary School, the old Argus building, Liberty Lofts – that evoke the character he says he wants to bring to this project. The buildings he cited are older, with brick facades. Liberty Lofts, at First and Liberty, is a former manufacturing plant that was converted to condos a few years ago. The site is zoned D2, a designation for areas that transition between the densest zoning allowed (D1) and residential areas. For this site, D2 zoning allows for a maximum 400% FAR (floor-area ratio). FAR, a measure of density, is the ratio of the square footage of a building divided by the size of the lot. A one-story structure built lot-line-to-lot-line with no setbacks corresponds to an FAR of 100%. A similar structure built two-stories tall would result in an FAR of 200%. With a 400% FAR, a building could be constructed up to 60 feet tall with 170,000 square feet of floor space, and still meet the zoning requirements. 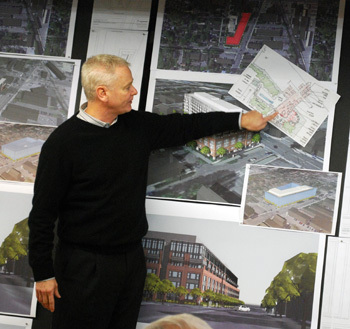 Ketelaar noted that the site is in the southern part of the Ann Arbor Downtown Development Authority district, and he hoped his development would encourage the DDA to improve the Main Street section south of Packard – perhaps in a similar way to the DDA’s current Fifth and Division streetscape project. Mike Siegel of VOA Associates – the Chicago-based architecture firm that’s working on this project – reviewed previous designs that had been considered by Ketelaar for the site. The team had begun by conceptually envisioning what a building would look like as permitted by zoning. When he described it as a glass block that’s 60 stories tall, he was quickly corrected to 60 feet. “It’s been a long week,” he quipped. The team initially considered putting in two buildings, with a narrow courtyard in the center. The structure facing Main Street would have been apartments, while the building on Ashley would have included townhouses and duplexes. Both would have been six stories tall. However, “we didn’t feel it was very sensitive to the neighborhood,” Siegel said. Residents and representatives of the developer look at drawings for a proposed six-story apartment building on 618 S. Main during a Nov. 11 neighborhood meeting, held in the sewing room of the former Fox Tent & Awning building. Siegel said the development team worked with Ann Arbor’s planning staff and came up with the design they’re proposing. The intent is to soften the edge facing the neighborhood on Ashley, which is lined with single-family homes. The main massing of the structure faces Main and Mosley, with a large courtyard area off of Ashley. Ketelaar noted that the site requires only about 70 parking spaces. They could have designed a surface parking lot, like Liberty Lofts, but “that didn’t seem right,” he said. Their current proposal calls for building two parking levels underground, with between 130-140 parking spaces. One issue is that the water table in this area is high, he said. They hit saturated soil about 10-12 feet below ground. So while one level of parking will be completely underground, the second level will be about halfway above ground – and that drives up the height of the building, he said. At the tallest point – the top of the elevator shaft – the building is about 80 feet high, as currently designed. That’s about 20 feet taller than the D2 zoning would allow. So the development will be submitted as a “planned project,” a designation that allows for flexibility in height and setback requirements, in exchange for public benefits. A “planned project” allows modifications of the area, height, and placement requirements related to permanent open space preservation, if the project would result in “the preservation of natural features, additional open space, greater building or parking setback, energy conserving design, preservation of historic or architectural features, expansion of the supply of affordable housing for lower income households or a beneficial arrangement of buildings.” However, all other zoning code requirements must still be met – including the permitted uses, maximum density, and maximum floor area. Ketelaar pointed to the additional parking and greenspace in the courtyard as among the public benefits of the project. Shannan Gibb-Randall – a landscape architect with Insite Design Studio, the Ann Arbor firm that also built the new rain garden in front of city hall – described the landscaping and other exterior features of the project. On the Main Street side, the 9-foot width between the street and the property line seemed too narrow, so the building will be set back an additional 5 feet from the property line, she said. Gibb-Randall also cited the Portland railroad car project as a model, with the intent to create layers of greenscape and richness to soften the front of the building. Balconies will also create a recess on the side facing Main Street, she said. Ideally, the city and DDA would eventually allow parking along that stretch of Main Street, she said, which would help to calm the traffic. Vehicles tend to pick up speed along that part of Main Street, she noted, as the road widens to four lanes south of Packard. For stormwater management, the project will use surface infiltration rather than underground detention, Gibb-Randall said. Large planters and porous pavement are among the strategies they’ll use – much like the design of the plaza and rain garden in front of city hall, she said. Siegel concluded the presentation by noting that the project will use sustainable building techniques and aim for LEED Silver certification. The meeting was attended by about 50 people, including nearby neighbors as well as people who are active in development issues citywide. Among others, they included Ray Detter of the Downtown Citizens Advisory Council; former planning commissioner Eppie Potts; Christine Crockett, president of the Old Fourth Ward Association; Alan Haber, who’s spearheading an effort to create a community commons on top of the South Fifth Avenue underground parking structure; Ann Arbor Ward 5 councilmember Mike Anglin; and Barbara Murphy, vice president of the Old West Side Association. For this report, questions and responses are summarized and organized thematically. Ketelaar said he didn’t think they could solve that problem – any development would have the same issues. Siegel noted the project will have about 140 parking spaces, double the number of required parking spaces. The development team also plans to have some vehicles on site from the Zipcar car-sharing service, as well as bike storage areas to encourage the use of alternative transportation. Mike Siegel of VOA Associates, a Chicago architecture firm, points to a detail in the courtyard of the proposed 618 S. Main apartment complex. In response to another concern raised about parking, Ketelaar said that the site is part of downtown, and the project is intended to attract young professionals in their mid-20s to mid-30s. About three-quarters of the apartments will be studios or one-bedroom units, he said. The apartments will be attractive to people who work in the growing high-tech sector, he said, like Barracuda Networks, which earlier this year announced plans to add several hundred employees here. These young professionals are active, he said, and the reason they live downtown is so that they can walk. One resident said the 25-35 age range might be low – the apartments would also appeal to people in their 40s or older, she said. Ketelaar agreed, observing that people his age often had the same kind of desires, in terms of urban living, that young professionals had. Another resident pointed out that the area is in a transition. The reality is that there’s no grocery within walking distance, for example, so most tenants would use their cars for that kind of trip. Someone asked whether the Ashley Mews condo development was fully occupied – that complex didn’t seem to have much impact on parking. It is full, Ketelaar said, and each unit has its own parking space within the structure. Siegel noted that if a “by-right” project were built on the 618 S. Main site, it could have about 200 units and 70 parking spaces, which would be allowed based on the D2 zoning. The project that they’re proposing would have fewer units – about 180 – but double the parking (about 140 spaces). Another resident noted that he lived on South Main and walked in that area frequently. From Jefferson to Hoover, parking in the neighborhood is already full, he said, adding that he didn’t there would be much difference in parking caused by the new development. Siegel asked whether neighborhood parking permits might be a solution. A resident noted that in some areas of the neighborhood, residential parking permits are already required. One resident asked whether the DDA is helping finance parking for the project. No, Ketelaar said, but he hoped the DDA would consider making improvements along Main Street south of Packard, including possibly adding onstreet parking to that stretch. In response to a concern about the visibility of the first-level parking, Ketelaar said it will be enclosed so that passers-by wouldn’t be able to see it. There might be some kind of greenery screen used as well. The two parking levels won’t be connected – one will have an entrance off of Ashley, with the other accessed from Main Street. There will be some guest parking available, possibly as surface spots in the courtyard area. A resident asked how tall the building would be, and why it would be allowed to go higher than 60 feet. The proposal calls for six stories plus a penthouse level: The first three stories would form a “street wall,” with three additional stories above that set back a few feet. A penthouse level on the roof would be set back even further, allowing the units there to have verandas. Ketelaar explained that a “planned project” designation allows for variances in height or setback. This project will ask for a height variance, he said. The public benefits that the project offers in exchange for that variance include a 17,000-square-foot courtyard and additional parking. He allowed that not everyone might agree that these are public benefits, but he thinks they are. He also noted plans to install solar panels on the roof, to reduce the building’s energy costs. When asked whether the use of large windows throughout the building will contribute to energy loss, Siegel said the building will use insulated, high-performance windows, possibly tinted. Residents will be able to open the windows, he said. One resident asked whether the mechanicals on the roof would be enclosed – does LEED certification address sound requirements? No, but the city’s building and zoning codes do, Ketelaar said. Siegel added that the mechanical systems will be surrounded by walls, but open on top. In response to a query about more details regarding the units, Siegel said there will be three sizes for two of the apartment types – studio and one-bedroom units – and five different sizes for the two-bedroom units. Rents will likely range from $950 to $1,400 per month. Another resident asked where the garbage and recycling would be located. There will be an area for trash and recycling on each floor, Siegel explained. Building staff will then empty the trash and recycling into a dumpster and containers on the north side of the building. The developer is negotiating an easement with the property owner on that north side to allow for trash and recycling trucks to make pickups from Ashley. In response to another question, Siegel said the public entrance to the building will be off of Ashley Street. Residents will have another entrance off of Main. How committed are the designers to the use of brick masonry? a resident asked. A decision on materials hasn’t been made yet, Ketelaar said. Siegel added that they’re very committed to using brick with steel detailing on the first three stories. He indicated a range of other architectural detailing that he hopes to include, including cornices at the street level and other ornamental touches. One resident said he’d like to see the first floor be retail, adding that it would be “great for the neighborhood.” Ketelaar said he’d thought about it, but couldn’t figure out what might work. Ketelaar said that when he first came to town in the late 1960s, there were a lot of businesses to serve downtown residents, such as drug stores and groceries. Though there aren’t that many now, he acknowledged, the idea is that with growth of developments to bring more residents, the services will follow. Doug Raab, owner of Washtenaw Dairy, talks with Ann Arbor city councilmember Mike Anglin at the neighborhood meeting for the 618 S. Main apartment project. Washtenaw Dairy is located a block away from the proposed development. A resident asked whether Ketelaar had considered putting his building on the empty lot where the Glen Ann project had been proposed. Glen Ann was a 9-story residential project that another developer had proposed and that the city approved, but it was never built. The vacant parcel is at the corner of Glen and Catherine streets, across town near the University of Michigan medical center. Ketelaar said he hadn’t considered that. The 618 S. Main property is in a unique location, he added, close to downtown and the UM campus. The same resident noted that neighbors are concerned about the impact of the development on the neighborhood, in part because apartment dwellers aren’t as invested in the neighborhood as condo owners, who would be less inclined to trash the neighborhood. Ketelaar noted that condos aren’t selling now, and that apartments appeal both to young professionals as well as to older people like him, who have the same interests in finding places to live where you can walk downtown, and that require far less maintenance than a house. One of his goals is to create a community, he said – that’s why they’re designing the courtyard space with seating, a small pool (though not one for swimming), and an indoor common living room on the first level, where people can hang out. When asked about public access, Gibb-Randall clarified that the courtyard isn’t a public park. It’s intended for use by residents. Ketelaar described it as the equivalent of someone’s back yard. A resident noted that the neighborhood already is a community. How will residents of the development interact with the existing neighborhood? They’ll become part of it, Ketelaar replied. Just because people are new to the area doesn’t mean they’ll be bad, he said. When asked about putting in a coffee shop as a way to help integrate the neighborhood, Ketelaar said he was concerned about competing with the existing coffee shop – presumably referencing Washtenaw Dairy, located less than a block away at Madison and Ashley. Doug Raab, an owner of Washtenaw Dairy, was sitting across from Ketelaar at Friday’s meeting. One of the residents responded by saying that with 200 more people in the neighborhood, they could use more than one coffee shop. Ketelaar was asked about other projects he’s been involved with, and what the impact was like on the neighborhoods for those. He said he hasn’t done a lot of development in Ann Arbor recently. He had been a principal in the 601 S. Forest project, but was bought out. That residential development is being constructed now and was controversial when it went through the city’s approval process – Ketelaar noted that some people who had been vocal about that project were also at the current meeting. He also cited Ridgewood condos, on West Liberty east of Stadium, as another project he’d developed. In response to a question about the floodplain, Ketelaar said the site isn’t located in the floodplain – it’s a few hundred feet from the edge of the floodplain, which is to the south, he said. One resident commented that in the flood of 1968, waters covered that area, and that while new federal floodplain maps will be released in April 2012, he wasn’t convinced they’ll be accurate. Bob Wanty of Washtenaw Engineering, who is also working on this project, said they have to use the maps that are available. Alan Haber, top center, asks a question while Julie Weatherbee raises her hand with another query. Dan Ketelaar, developer of the 618 S. Main project, is seated at the far left. Behind him is Shannan Gibb-Randall, a landscape architect for the project. A resident asked how the stormwater system will work, given the building’s large footprint on the site, and the fact that there will be two levels of underground parking. Gibb-Randall said they plan to “max out” the courtyard in terms of greenspace to absorb the water. When asked if this approach will work in the winter, Gibb-Randall said yes. Her firm has done over 70 rain gardens in Ann Arbor, she said, and while there is a limited palette of plants that can handle the seasonal changes, it’s possible to do. She described how when plants put down roots, about a third of those roots eventually die – creating channels underground that allow water to flow through. She plans to use as many native plants as possible. 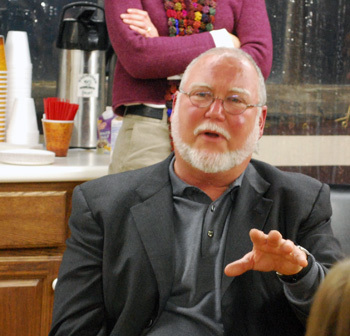 Mike Anglin – one of two Ann Arbor city councilmembers representing Ward 5, where this project is located – asked Ketelaar about the project’s brownfield status. The site is considered a brownfield because it includes an underground fuel tank. The site across the street – Armen Cleaners, at the northwest corner of Mosley and Ashley – is also a brownfield, and there are monitoring wells in the area because of contamination there. The 618 S. Main project is developing a brownfield plan, which will be submitted to the city along with the site plan. Ketelaar said they’ll apply for tax increment financing (TIF) to help remediate the site, but he wasn’t sure what amount they’d seek at this point. Anglin said it would be useful for the community to have results from any environmental testing that’s done on the site. Ketelaar noted that those tests would be submitted as part of the brownfield plan. The city had approved brownfield credits for 601 S. Forest in 2008, when Ketelaar was still involved in that project. In response to a query about taxes, Ketelaar said that the owners of Fox Tent & Awning were paying about $18,000 in taxes each year, because they had owned the property since the 1930s. After the new development is built, he said the taxes will increase to over $500,000 annually. Ketelaar was asked if he is confident he can build the development, from a financial perspective. He explained that typically, a project like this is 65% debt financed, with 35% equity. In this case, he said, the project is eligible for financing from the U.S. Dept. of Housing and Urban Development (HUD), through a 40-year loan – that will be part of the financing package. He noted that even now, many banks aren’t lending. Following Ketelaar’s quip, Anglin said he wanted to encourage Ketelaar to think about working to make Main Street a two-lane road along the section south of Packard. There’s no reason why it shouldn’t be just one lane in each direction, Anglin said, and it would help the community for Ketelaar to make that happen. Ketelaar responded by noting that “all we can do is suggest it.” [Changes to city roads would involve the city government and, for trunk lines, the Michigan Dept. of Transportation.] He said he’d had a brief conversation about it with Susan Pollay, executive director of the DDA, but that the DDA and city council would make any decision regarding Main Street traffic lanes. Anglin asked whether at least the group could leave the meeting that night with the idea that a traffic study will be done. Ketelaar replied that a traffic study will be done as part of the required site plan submission. He also said he’d be happy to talk with Anglin about making a presentation on this issue to the DDA. Describing the meeting as wonderful, Ray Detter noted that this is the second project that will go through the city’s new design review process. The first project to be reviewed in this way – The Varsity Ann Arbor – had just been approved by city council the previous night, he observed. The city of Ann Arbor adopted design guidelines in February 2011. New developments must be evaluated by the design review board, but compliance with the board’s feedback is voluntary. Detter urged people to attend the design review board meeting at 3 p.m. on Wednesday, Nov. 16 in the same location, at 618 S. Main. That meeting will be followed by another community forum on Tuesday, Nov. 22 from 5-7 p.m. Ketelaar has previously met with some local business owners and members of the Old West Side Association board to discuss the project. The project is expected to be formally submitted to the city later this month. After review by the city planning staff, it will be considered by the planning commission, which will make a recommendation to city council. The Chronicle survives in part through regular voluntary subscriptions to support our coverage of local government and civic affairs. If you’re already supporting The Chronicle, please encourage your friends, neighbors and coworkers to do the same. Click this link for details: Subscribe to The Chronicle. 2 lanes on Main between Madison and Stadium? Ugh! I could see perhaps 3, with a dedicated turn lane, but 2 lanes would be a disaster. A couple of links I think may have been missed in the article are in the city’s etrakit file. I’ve included them here for convenience sake, they were very instructive to me. I am still going over the article, and haven’t formed an opinion about the overall project yet, but there are a few things that stick out to me, good and bad, about this. A ground level, uncovered, outdoor swimming pool that close to Main Street and downtown seems like a disaster waiting to happen; honestly, if I was a resident I wouldn’t use it, I’d feel like a zoo animal on display. The mix and size of apartments in the project seems very reasonable, if not spartan, but it’s more realistic to expect a person to want a small place of their own than share it with a half dozen strangers like some of these new luxury apartment buildings expect of people. Certainly a traffic study is needed with a new element like this possibly going into the area, but let’s not start painting lanes yet, there’s a lot of traffic on Main from Depot to Stadium that shouldn’t be there at all, it just doesn’t have anywhere else to go. The pool in the design isn’t intended for swimming – it was described as a “feature” pool. My understanding is that it would be shallow and ornamental. I wish this town could move away from the brown-brick, Hobbs and Black aesthetic. The design doc references Argus, Bach School and the (new) Math Reviews building–all worthy buildings, but a recipe for monotony if they’re the models we use everywhere. Rod, what do you suggest the appropriate aesthetic should be? This seems to be an appropriate response to the guidelines and the adjacent OWS neighborhood. This building has brick, agreed, but it also has a lot of metal panel. Do you prefer a more modern design respond? I believe that the newest City building, the courts building attached to city hall (coincidentally, a Hobbs & Black project), has no brick and has caused no small amount of controversy with it’s aesthetic. Not every building should be a signature building. We need plenty of background buildings, too. I’m also glad to see an apartment building rather than condos and one geared to young professionals. That makes sense and sounds sustainable over the long term. I’m worried about what is going to happen to all those buildings designed for luxury student accommodation once they age out a bit. Has Ridgewood condos ever actually been occupied? I thought it was an empty hulk for a long time. Vivienne, you are correct. It was not Hobbs & Black but rather Quinn Evans. They’re all the same, no? My mistake. Still stand by my assessment and endorsement of the project that happens to be in my neighborhood. Ridgewood condos is actually a very nice development that has been there for many years. South side of Liberty, couple hundred yards east of Maple. I dont think it is what you were thinking of. The development I was thinking of is near 7th on Huron. Maybe called the Ravines or something. Sorry for the confusion but glad to have that cleared up. I like how the architectural rendering shows the building in late afternoon, rather than early morning when the shadow would fall on the houses and Dairy on Ashley. Sorry, I didn’t mean that it was a Hobbs and Black building, but rather that there was a distinctive aesthetic that is often associate with H&B (thus their nickname “Hobbs and Brick”). Marvin, my answer would be… variety. Every building is a distinct design challenge, and should be a response to its specific needs. And personally, I’m sick of brown brick. That’s just me, though. The moniker you are searching for is “Gob’s of Brick”. I would love to live downtown, but to be honest I’d rather own a condo or house and pay a mortgage as high as these rental rates. I am 29 and work for a rapidly growing successful company near downtown. There are many young professionals though that do rent apartments and I can see this being quite marketable to those that do rent. At this time, the economy will dictate the capacity for such a project. I hope this is successful though, because a development that brings more people near downtown is a major benefit to sustaining the livability of our area when done right.